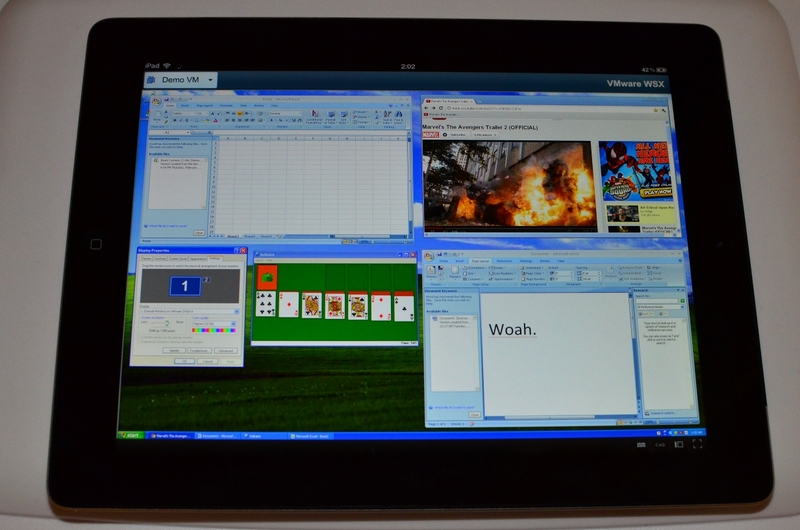 A month ago, I announced the release of the June VMware WSX Tech Preview. In it, I covered our awesome new Retina support for MacOS X and iPad, voice input, Windows support, and more. We had some great feedback and worked to address some of the key issues, while putting in a few new things. Today I’d like to announce the WSX July Tech Preview, which is chock full of improvements. Let’s go over them, shall we? The Home page on WSX was a bit.. barren. Completely blank and useless, in fact, but no more. 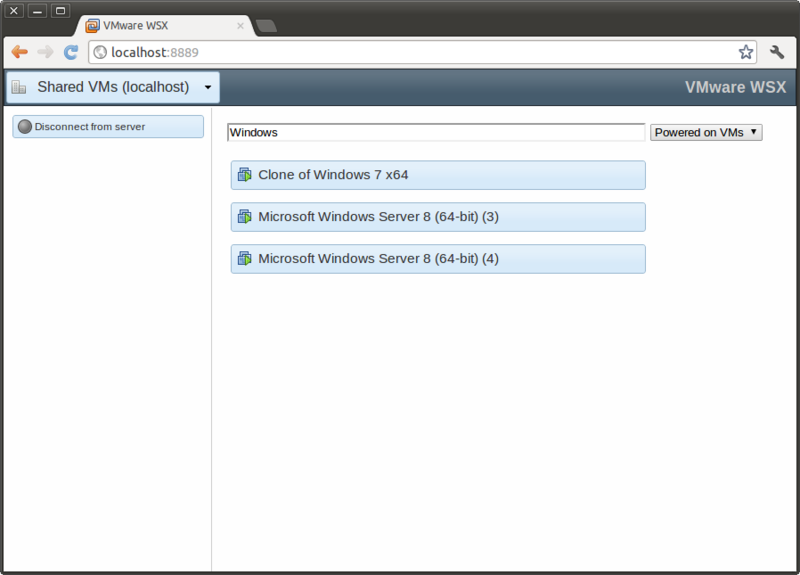 Now the Home page serves as a jumping point to get to your servers and to configure your server list. This replaces the Configuration page. In the future, I’d like to further improve this by giving quick access to your most recently used VMs. The Server Page was a jumbled mess of links to VMs. Now it’s a nice, filterable, alphabetical list. Search for your VMs by typing part of their name, or filter them by power state. It’s much easier now to find what you need. Oh, and the VM icons now show the power state as well! Much like VMware Player and Fusion, we now show a Power On button on top of the screen when the VM is powered off or suspended. This gives you both a nice visual showing what state your VM is in, and a big, easy to hit target for powering it on. Particularly great for touchscreens. Working with your VMs on an iPad is now much, much nicer. We map a bunch of gestures to mouse events, giving you support for right-click, middle-click, and scrolling. To right-click, just tap-and-hold part of the screen. Or you can press with one finger and tap with a second. Pressing instead of tapping with the second finger is equivalent to holding down the right mouse button, letting you drag around the screen. The actual click will take place where you pressed the first finger. Just add a third finger to the mix to work with the middle button. That is, press with one finger and then tap (or press) with two more fingers. Drag up or down with two fingers to scroll. This works just like the mouse wheel. If you’re using WSX from a PC or Mac, your mouse wheel should now work! Scroll to your heart’s content. Retina was cool and all, but reconnecting to a VM would put that VM back in non-Retina mode, moving all your windows and icons around. No more! Now if your VM was in Retina mode before, it should be in Retina mode when you connect next. 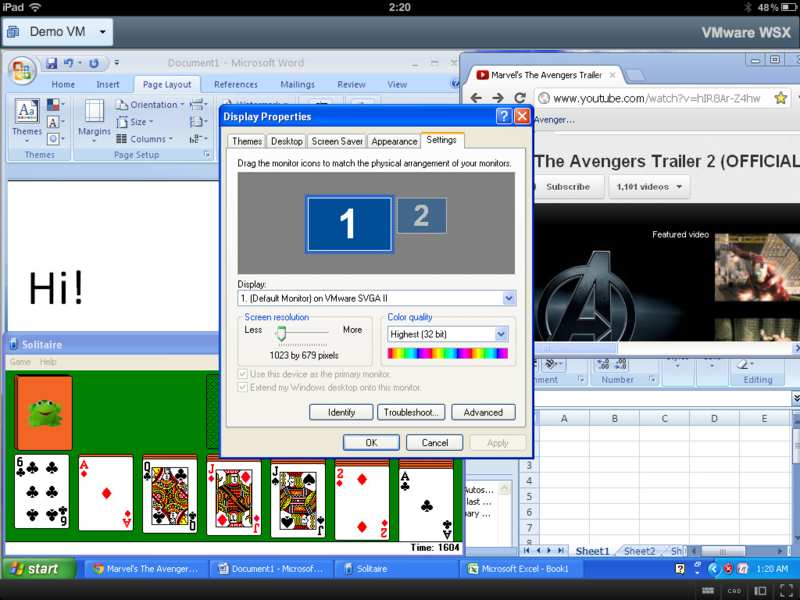 You can pretty easily live in Windows 7 with high-DPI set in Retina mode on an iPad 3 now. There’s also new Retina icons on the action bar below the screen. WSX can now (optionally) encrypt all the traffic between the WSX server and your computer or mobile device. You only need to generate or purchase an SSL certificate, name the files wsx.crt and wsx.key and place them in your /etc/vmware/wsx/ssl/ directory (on Linux) or Application Data\VMware\VMware WSX\SSL directory (on Windows). Why isn’t this the default, you may wonder? Of course we’d love to just generate self-signed certs by default and encrypt everything, but it turns out there are some browser compatibility issues with self-signed certs and WebSockets, which we use for all our communication. iOS, in particular, is currently broken in that regard. There are many places on the web where you can get free or cheap certificates that should work fine for you. We highly recommend installing an SSL certificate to enable HTTPS for WSX. Another option is to require access to WSX through a secure VPN. Some Windows and Linux users hit problems with our installation in the previous release. A few Windows users had a crash at startup. This was due to a naming conflict causing an early failure, which we’ve fixed. Linux was a bit more of a complicated story. We required a specific version of Python on the system, and while not an uncommon version, it proved to be too hard to get going on many systems. This is no longer a requirement! You don’t even need Python installed. We run completely independently now. So give it another try! New installs would come with a “Shared VMs” server pre-configured. 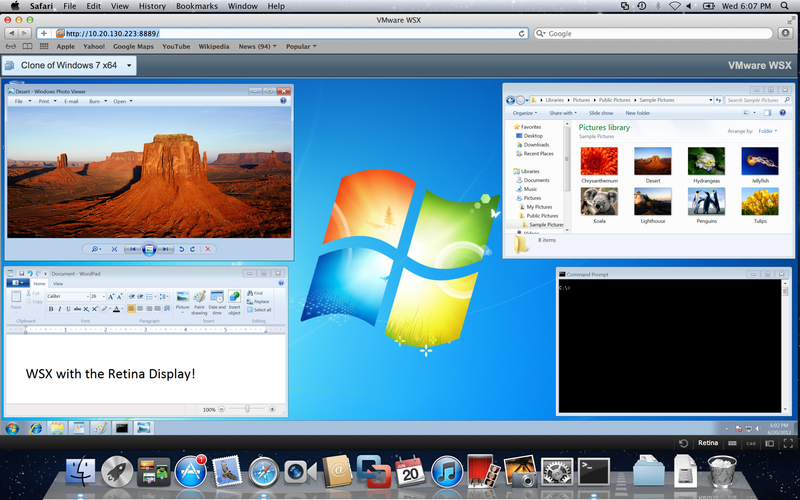 The intent was to make it easy to get to your Workstation Shared VMs. 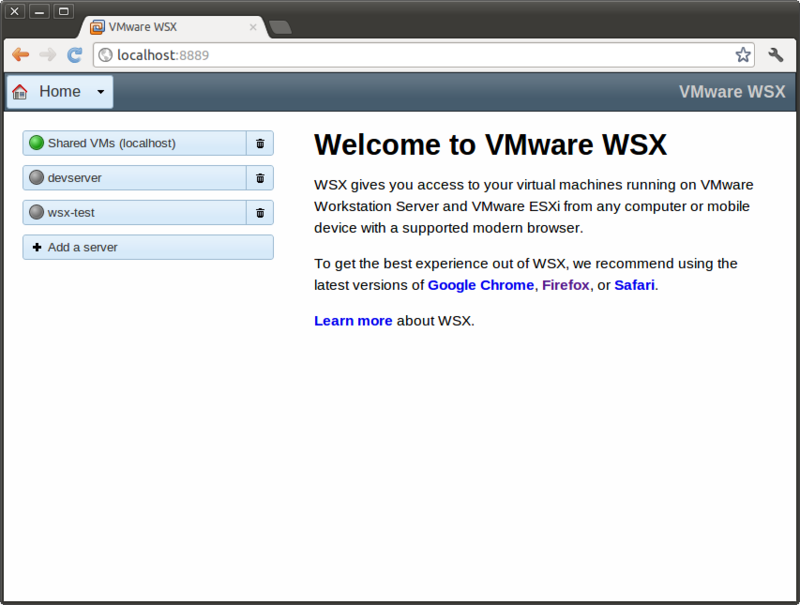 Some people, though, had changed the port for their Shared VMs, which confused WSX and caused some problems. We’ve improved the smarts to only add this server if it’s installed on the same system as Workstation, and to grab the port from that configuration. Connecting to the VM should be a bit faster now. 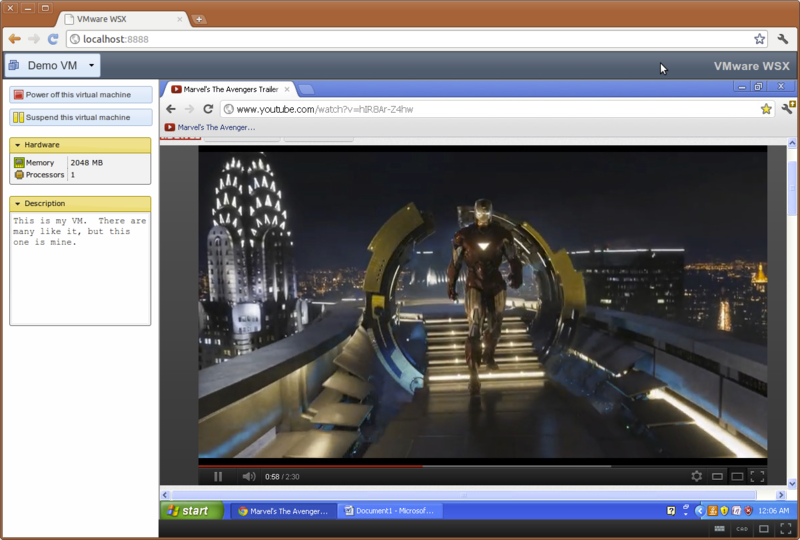 Resizing the browser window no longer causes the VM to take forever to update its resolution. We were spamming it with resolution change requests. Fixed a crash when accessing some Linux VMs that had Tools but didn’t support switching resolutions. Fixed the styling of some parts of the UI on some browsers. The Log In page, in particular, looked pretty broken on the iPad. Connecting to vSphere will still only show VMs in the root VM folder, and not in subdirectories or datacenters. Work is still needed here. As always, please let us know if you hit any problems or have any questions! 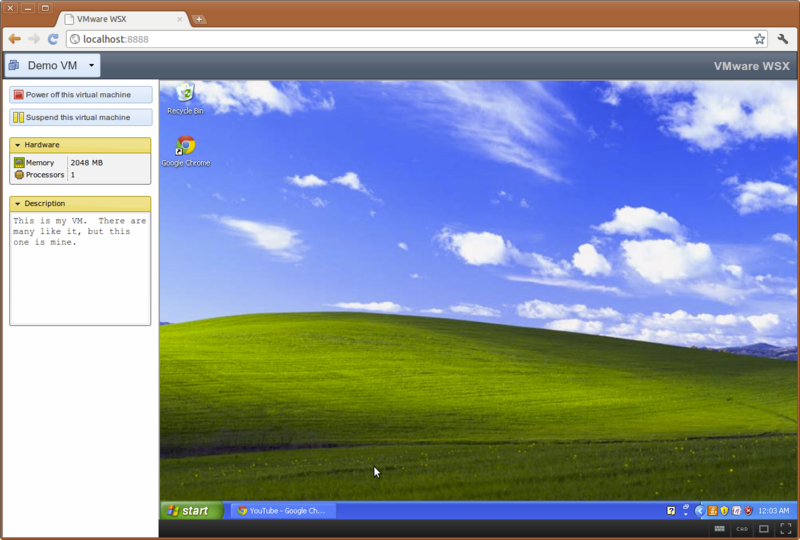 A few months back, I introduced VMware WSX, a new product I’ve been developing at VMware to access virtual machines in any modern web browser without plugins. The response blew me away. News spread to Ars Technica, Engadget, Windows IT Pro, InfoWorld, and many other publications and sites. I’m happy to announce that we’ve released another build today: WSX Tech Preview 2. 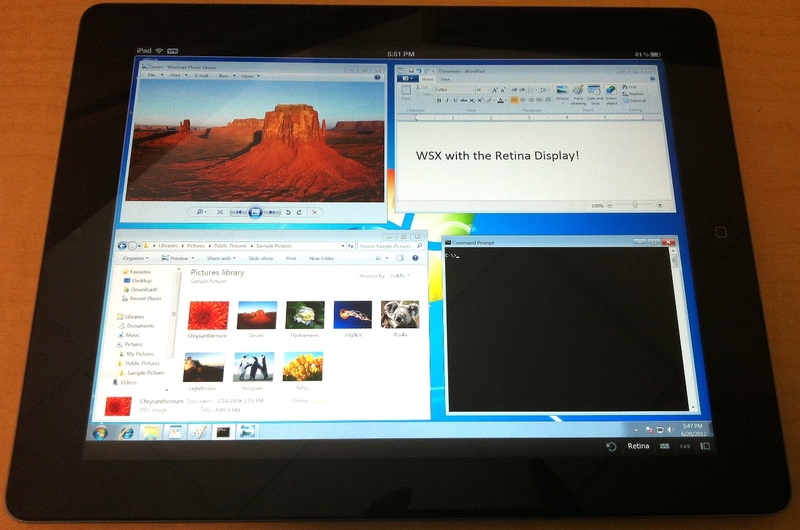 You can get it on the Workstation Technology Preview 2012 forum. Just click “Downloads” and download either the Windows or Linux installers. Like the first Tech Preview, this is a prototype of what’s to come. I’m actively working on a rewrite that will prove much more reliable, with better compatibility and room for future growth. We have a pretty good release, here, though, and I’d like to break down what all has changed. 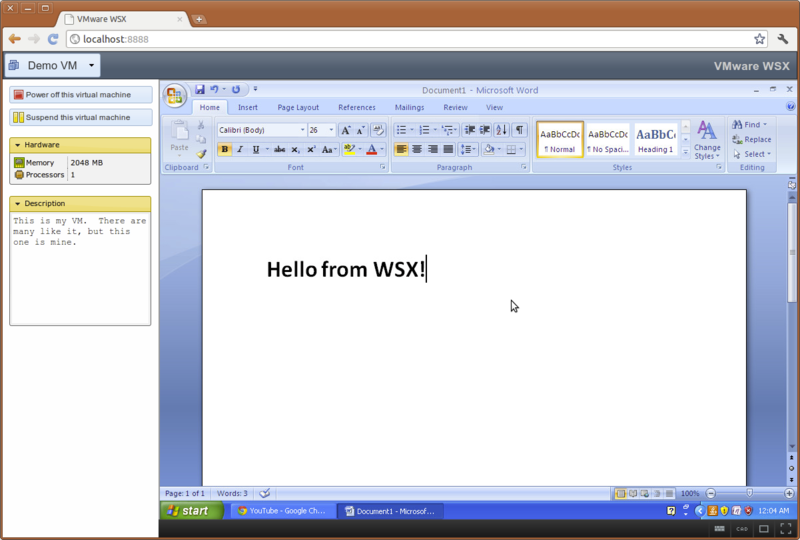 The first preview of WSX was only for Linux. 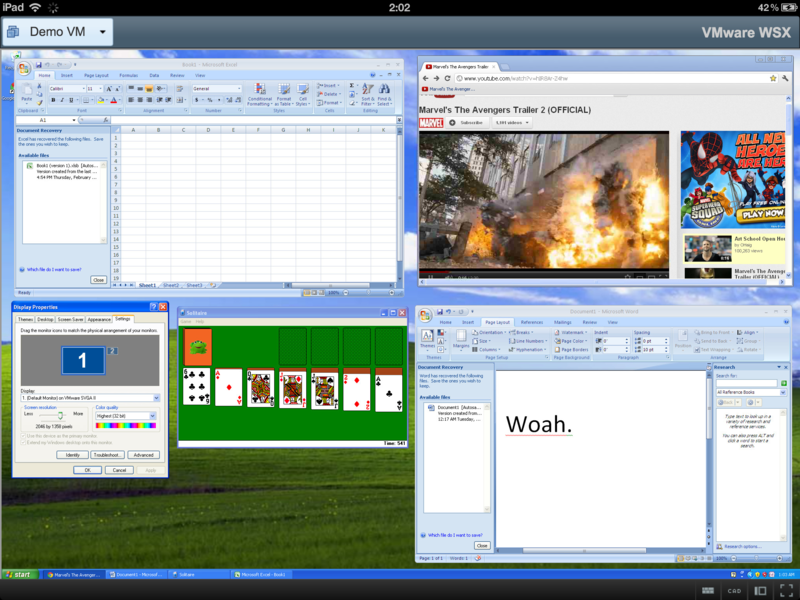 I work primarily on Linux, and as such, this was my priority. While we weren’t able to get a proper Windows build ready for TP1, we now have it for TP2. So Windows users, if that’s been holding you back, give it a try now! We’ve optimized the rendering to the screen. This should result in faster updates, making things much smoother, particularly on iOS. We’ve added some mobile (and specifically iOS) rendering improvements, and they really help. 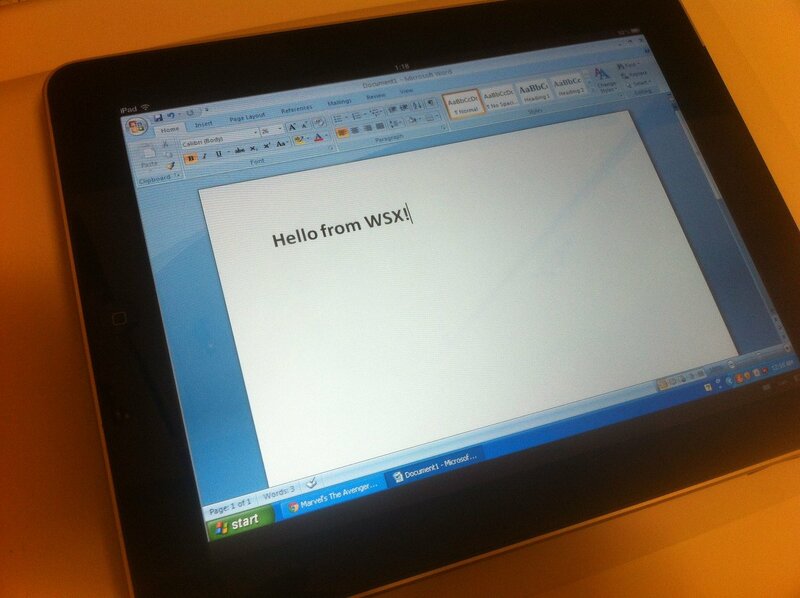 As we continue to evolve WSX, expect the experience on mobile to only get better. But wait! MacBook Pros have Retina displays too! You know that little microphone button on the iOS keyboard on the latest iPad/iPhones? 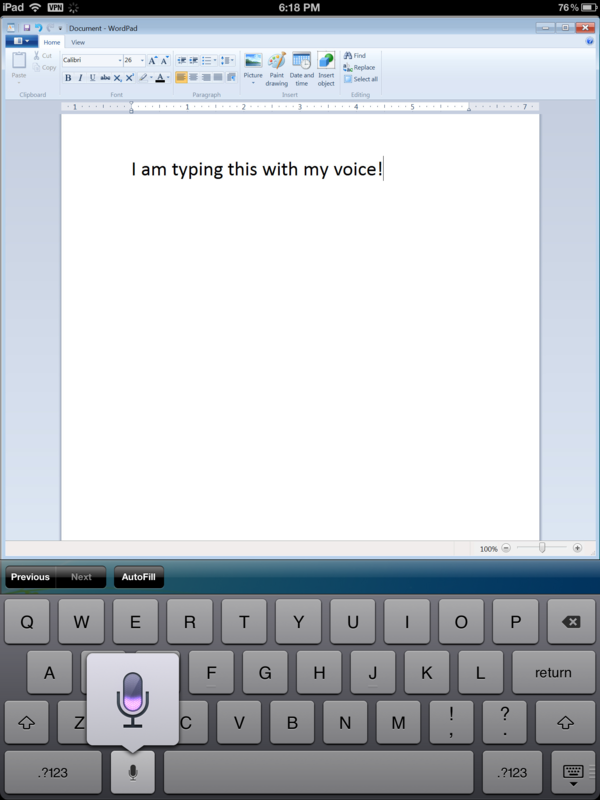 Pressing that allows you to “type” with your voice on native applications. Now, we support it as well. Open up an application in the VM (Word, for example), pop up the keyboard, and hit the microphone. Begin speaking, and your words will appear automatically in your application as if you were typing them. It’s fun! I will warn you, this is not fully baked yet. The main problem with Android is that most browsers, especially the stock Android browser, do not support the modern web features we need. WebSockets and fast Canvas rendering being a couple of the key issues. Those that do, like Firefox, suffer from other glaring rendering problems that make for a bad experience. Work is being done here, though, and if you’re running on an Android browser without WebSockets, we now attempt to use a Flash shim that communicates with the server. This makes WSX semi-usable on the Android browser. However, it’s not fast, and there are input problems. In time, I hope to improve this. Input is much improved. Capital letters and most special symbols now work. There are issues still with international characters, though. Backspace key repeats now work, too. Various fixes for things like question dialogs not appearing, username fields having auto-capitalize/correct on, and other little issues here and there. When a login attempt fails, you’ll see an error saying what went wrong, instead of seeing it wait forever. We show a spinner now when attempting to connect to the VM’s display. This provides some feedback, especially over slower connections, and mimics what we do with Workstation. Attempting to change the power state of a VM now shows a spinner on the appropriate power button. So, press Power On, and the button will spin until it begins to power on. If the connection to a server drops, you’ll be notified and taken back to the Home page. Login pages aren’t so bare anymore. The giant useless margin on the left-hand side of most pages have been removed. Connecting to vSphere no longer totally fails. Many users were having some problems with that, and I’m happy to say it should work better now. It’s still not meant to handle thousands of VMs, though. Pressing Control-Alt-Delete now actually sends that to the VM. Sorry for all of you who couldn’t log into Windows. WSX no longer disconnects when updating the screen resolution fails. If you connect to multiple servers, the inventories should be correct on each. Previously, they’d sometimes show the wrong server’s inventory. Occasionally, the screen may stop updating. We’re looking into that. In the meantime, there’s a Reload button you can press to re-establish the connection to the VM’s display. I can’t give away all my secrets, but we’re looking into better ways of handling input in the guest (especially with touch devices), and making WSX a bit more scalable. We’ll continue to put out Tech Previews of WSX while it matures. In the meantime, let us know how it’s working for you. The most talked about feature of the new iPad is, of course, the shiny new retina display (a 2048×1536 resolution). A few apps really show this off, and text is certainly crisp, but a few people wondered aloud, “Is it really that big of a difference?” Yes, it is. 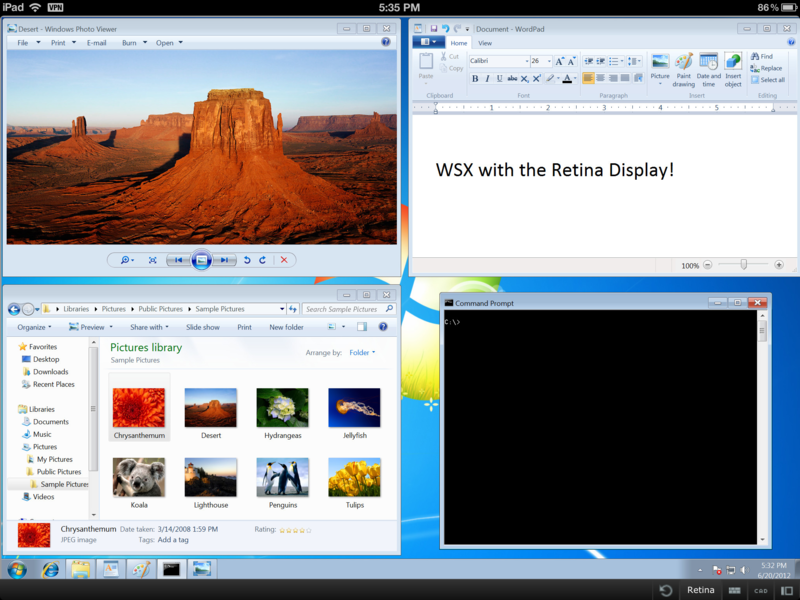 Naturally, I had to play around with getting WSX to show a retina-friendly desktop. See, by default, everything is scaled up 2x to simulate the resolution of the original iPad (1024×768), but they have some support in there for loading higher-resolution images. Turns out, with some tricks, you can also make the canvas retina-friendly. So let me show off what my desktop here looks like with some apps open on the iPad 1. Okay, that’s a bit crowded, but it’s only a 1024×768 resolution (minus some UI at the top of the screen). How about with the retina display? Wooo. Looks pretty awesome, right? Of course, the problem is that everything is very tiny. This is usable if you increase the DPI a bit, but I’m thinking about some magnifying support now. Still, pretty cool.